We had a rainy morning, but now the sun is shining brightly. Tomorrow we enter December and still no snow. Hopefully we won’t get it all at once! The temperature is showing 42 degrees. Daughter Elizabeth and Abigail are here for the day. Elizabeth takes care of a little four-year-old girl named Nikiah every day while her mother works. Her mother is a friend Susan used to work with. With Nikiah and Abigail, she has her hands full. Nikiah likes to dress in Amish clothes when she comes here, and she likes to ride in the buggy with Elizabeth and Abigail. She calls me “Mom” because I’m the “Mom” around here. Daughter Susan just left for a doctor appointment. Elizabeth brought a French toast casserole for our breakfast. The girls are washing dishes and sweeping floors and, of course, visiting. I am debating if I should move to my desk in our bedroom. If I’m not careful, I’ll start writing what they are saying! Ha, ha! After I have this column written, we have plans to go to an Amish general store that just opened a few miles from here. They have an open house this week. Daughter Verena volunteered to stay here with Nikiah and Abigail. 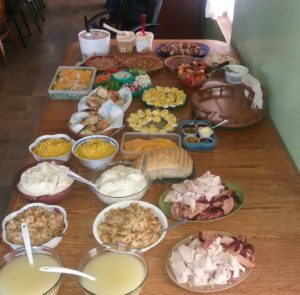 Feeding 26 people on Thanksgiving Day requires a long table. On Thanksgiving Day we had a total of twenty-six here. Jacob, sister Emma, Elizabeth and special friend Manuel; Emma and special friend Menno; Jacob Jr., Benjamin and Steven; sisters Verena and Susan; Timothy, daughter Elizabeth and Abigail; Mose and daughter Susan; Loretta’s special friend Dustin and nephew Henry all joined us for Thanksgiving dinner. On the menu were two big turkeys (one was a smoked turkey), mashed potatoes, gravy, dressing, corn, lettuce salad, veggies and dip, deviled eggs, cheese, homemade bread and dinner rolls, apple, pumpkin, cherry, and peanut butter pies, pumpkin roll, fresh fruit mixture and ice cream. Needless to say, not many were hungry for dessert with dinner! Before everyone left I put out all the food again so they could eat something. Lovina’s Thanksgiving menu included these mouthwatering dishes. But we still had more food left over, so I took it along to Mose and Susan’s house the next day. Jacob and sons, Menno, Manuel, Timothy, Dustin and Joe and our sons assisted son-in-law Mose in putting up new drywall in their house they will move to. We women and girls heated up the leftover food from Thanksgiving Day here at our house and took it over there for those hardworking men and boys. We all ate in the garage, since the house was dusty. Mose and Susan really appreciated all the help they had. A lot was accomplished that day. Most of the drywall was hung. Last night my husband Joe went with Mose to get a stove and new flooring for the house. The house is ready for drywall mudding once the heat is going in the house. I am doing a lot of mail-order Christmas shopping and decided to send off for a meat saw for my husband Joe for his birthday, which is on December 22. He will be 49 this year. The UPS truck drove in, and I didn’t think anything of it when Joe said he would go out to get the package. I just didn’t think his gift would be arriving yet! So I didn’t know which way to look when Joe walked inside with the box, which clearly showed that it was the meat saw. He had a big smile on his face and asked where I want the box. I knew I couldn’t make him believe that it was for someone else, so I just told him happy birthday. He was very glad for it, as he had been wanting one for a while. His birthday is so close to Christmas, so I guess it’s nice to have his gift early for once. I hope you found the answer: just call 800-245-7894. The book is $22.99.